You can add a page heading and/or a page footing to a report. A page heading is text that appears at the top of every page of a report. A page footing is text that appears at the bottom of every page. You can specify whether the page heading and/or page footing is left justified, right justified, or centered. Individual lines in the page heading or footing can be assigned a different justification. For example, you can have a two-line page heading in which the first line is right justified and the second line is centered. The heading or footing can display the current page count and total page count. Note: The Page Heading and Page Footing are turned on by default. If you previously specified a subheading, subfooting, or subtotal, those fields also appear in Report Painter. If you are sorting the data in a report, you can add subheading and subfootings at sort breaks. For details, see How to Add a Subheading or Subfooting at a Sort Break. Select Page Heading or Page Footing from the Insert menu. The Page Heading and Page Footing objects appear. Note: If you previously specified a subheading, subfooting, or subtotal, those fields also appear in Report Painter. If your Page Heading or Footing is not shown in Report Painter, ensure that Boundaries is selected on the Report Options View tab. To position the cursor in the page heading or footing, click in the heading or footing area. Type the heading or footing text. Place the cursor in the page heading/footing where you want to embed the value. Double-click a field from the Fields tab in the Object Inspector. Highlight the line you want to justify. Right-click the highlighted line and select Justify from the context menu. Select the justification option from the cascading menu. To place the footing at the bottom of the page, right-click and click Footing Bottom from the context menu. You can also perform a calculation or other operation on a field value in a page heading or footing. Note: Report Painter shows one page vertically. If you have a large Page Heading, you may increase the virtual screen size of Report Painter to see the full report. For more information, see How to Customize the Virtual Screen Size for the Report. Suppose that you want to see total sales at different levels within your enterprise. 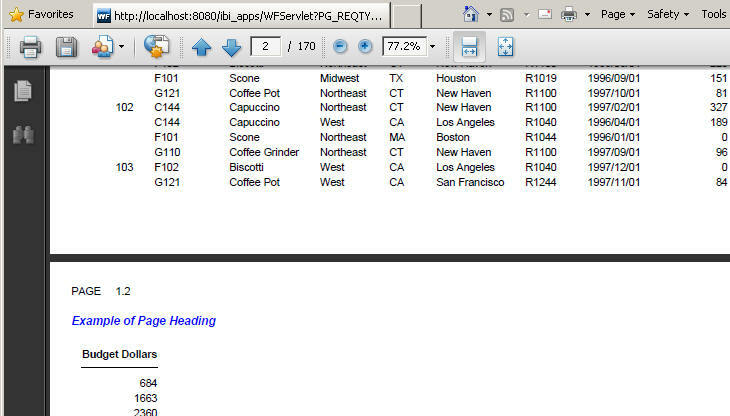 The following example shows how to create a report of total sales for Gotham Grinds within each region and city, and embeds the total sales quota in the page heading. Identify your sort columns. Click By on the Report Painter toolbar and double-click or drag REGION and CITY from the Fields tab of the Object Inspector. Embed the total sales quota in the heading. Place the cursor after the two spaces then double-click or drag BUDDOLLARS from the Fields tab in the Object Inspector. Highlight <BUDDOLLARS. Right-click and choose Prefix Operators then TOT from the context menu. The field appears as <TOT.BUDDOLLARS, indicating that it will be totaled when the report is run. Press the Enter key twice to leave two lines between the heading and your report content. Note: If your Page Heading is not shown in Report Painter, ensure that Boundaries is selected on the Report Options View tab. When the columns presented on PDF reports cannot be displayed on a single page, the pages automatically panel. Paneling places subsequent columns for the same page on additional pages until the entire width of the report is presented, after which a new page number is generated with a new set of panels. In order to make panels following the initial panel more readable, you can repeat headings and footings on each panel page and turn on page numbering. The panel designation is shown in Report Painter and in the report output. Note: Headings and Footings can be a Page Heading, Page Footing, Subheading, or Subfooting. In Report Painter, create a report using the PDF output format. Click Format from the Report menu. The Report Options dialog box opens at the Format tab. Click Repeat headings/footings per panel, located under the View/Print options. Click the Output tab and click ON from the Page numbering drop-down list. Note: This step is recommended, as it is easier to identify paneled pages with page numbering on. Click Apply and then OK to close the Report Options dialog box. The following example shows a PDF report when all of the columns cannot be displayed on a single page. Note the page numbers. Page 1.1 displays the By field, Unit Sales, and the page heading, as shown in the following image. Page 1.2 displays the last column of the report, Budget Dollars, on a paneled page so that the entire width of the report is shown, as shown in the following image. The following image shows the same report with Repeat headings/footings per panel enabled. Page 1.1 is the same. Note that Page 1.2 displays the paneled page showing the last column of the report (Budget Dollars), and the repeated page heading, as shown in the following image. Create a new procedure using Report Painter. Change the report type to PDF. Add the fields you want displayed to the report. Click the Page Heading button. A page heading is inserted into your report, as shown in the following image. Right-click and click Alignment Grid, as shown in the following image. The Insert Alignment Grid dialog box opens. Right-click the page heading and click Grid Options, as shown in the following image. The Properties for Page Header dialog box opens to the Style tab. In the Layout section, select the Align column titles (Section 508) check box, as shown in the following image. You can add a report heading and/or report footing to a report. A report heading is text that appears above the page heading at the top of the first page of the report. A report footing is text that appears below the page footing at the bottom of the last page. The report heading and footing options are especially useful if you only want certain text to appear at the top of the first page or at the bottom of the last page. For instance, if you are creating a sales report, you can type Sales report for [your company] in the report heading and Report created by [your name] in the report footing. You can specify whether the report heading and/or report footing is left-justified, right-justified, or centered. Individual lines in the report heading and/or footing can be assigned a different justification. For example, you can have two lines in a report heading where the first line is right-justified and the second line is center-justified. Click Report Heading or Report Footing from the Insert menu. The Report Heading and Report Footing objects appear. In the Report Heading object box, type the desired heading or footing, or double-click a field from the Fields tab in the Object Inspector to add it to the heading or footing. Click the appropriate justification button on the Font toolbar. Place the cursor in the object area (that is, subheading, subfooting, or page-break) in the Report Painter window. Right-click and click Insert Date from the context menu. Click Insert Date from the Properties menu. Select the date format from the cascading menu. You can change the display of the date format. For more information, see Assigning Date/Time Formats. 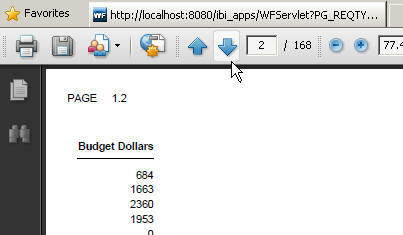 You can insert the current page number and the total page count in the page heading or footing of a report. Right-click in the page heading or page footing. Click Insert Page Markers, and click Current Page Number from the cascading menu. A field marker indicates placement of the current page number. Click Insert Page Markers, and click Page Count from the cascading menu. A field marker indicates placement of the current page count. When creating a report with the Portable Document Format (PDF) output format, you can embed a .SWF file that is Adobe Flash Player compatible in the page heading. .SWF files that are Adobe Flash Player compatible combine vector graphics with animation effects that are scalable and provide a perfectly smooth transition of lines and images, creating the highest quality outward-facing PDF documents with engaging functionality and better visualization of data. Adobe Flash Player must be installed to view .SWF files that are Adobe Flash Player compatible. You may embed the Adobe Flash File (.SWF files that are Adobe Flash Player compatible) as a File, URL, or Hold File, and set the page heading properties for the source .SWF files. These options are available from the embedded Flash file tab of the Properties for Page Header dialog box in Report Painter. Note: The embedded Flash file tab appears only if the report output is set to PDF. 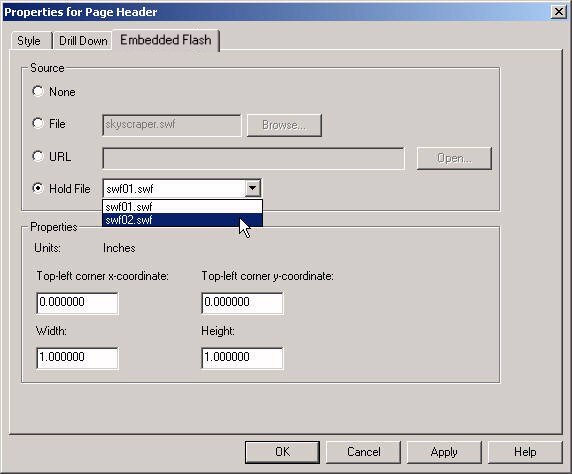 The following image shows the options that are available on the embedded Flash file tab for a page header when using the PDF output format. Right-click inside the Page Heading object in the Report Painter window and choose Options from the context menu. The Properties for Page Header dialog box opens at the Style tab. 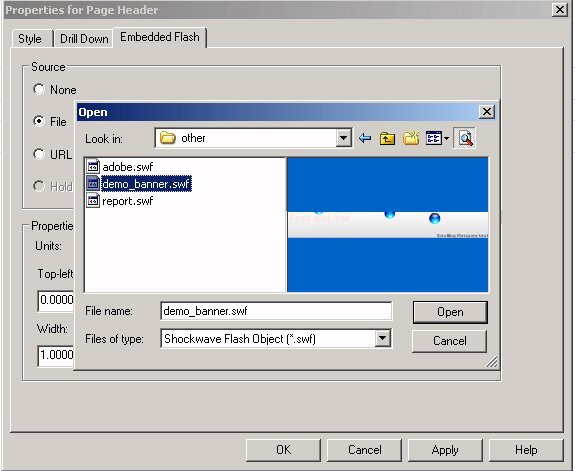 Click the embedded Flash file tab to view the embedded Flash file options. The embedded Flash file tab appears only if the report output is set to PDF. 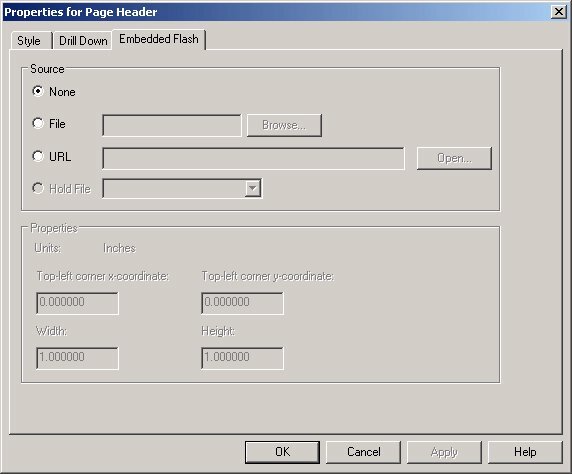 Indicates that no embedded Flash file is selected for the page heading. This is the default option. Indicates the .SWF file that is Adobe Flash Player compatible is embedded in the page heading. Click Browse to select from a list of Shockwave® Flash Objects (.SWF files that are Adobe Flash Player compatible) in your project directory. Indicates the URL source that is embedded in the page heading. Type the location of the .SWF file that is Adobe Flash Player compatible in the URL and click Open to verify the URL source in your web browser. Note: The Open button is not activated until the location of a .SWF file that is Adobe Flash Player compatible is included in the URL source. Indicates the .SWF file that is Adobe Flash Player compatible hold file that is embedded in the page heading. Use the drop-down list to select from the list of temporary hold files. Enables you to set the properties for the source of the .SWF file that is Adobe Flash Player compatible in the page heading, if you are using a File, URL, or Hold File. The top-left corner x-coordinate position of the embedded Flash file in inches. The top-left corner y-coordinate position of the embedded Flash file in inches. The width, in inches, for the embedded Flash file in the page heading. The default width is 1 inch. The height, in inches, for the embedded Flash file in the page heading. The default height is 1 inch. This process describes how to embed an Adobe Flash file in a page heading. In Report Painter, open or create a report using Portable Document Format (PDF) as the output format. Position the cursor in the page heading by clicking your left mouse button in the Page Heading object. Type the heading and apply any styling. 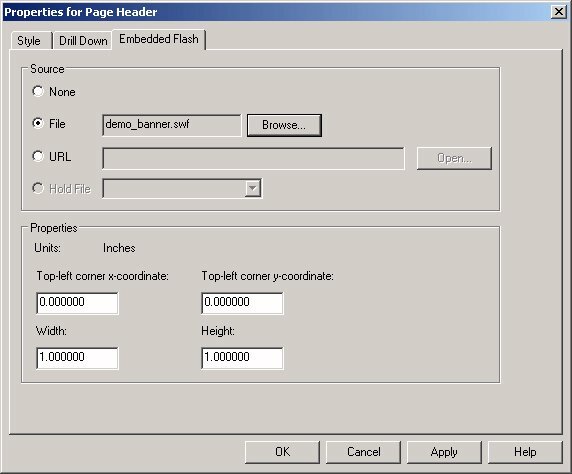 To embed an Adobe Flash File in the page heading, right-click anywhere inside the Page Heading object and click Options, as shown in the following image. The Properties for Page Header dialog box opens at the Style tab. Click the embedded Flash file tab. You may embed a file, URL, or hold file as the Adobe Flash File (.SWF files that are Adobe Flash Player compatible) source. Click File as the source. The Properties section of the embedded Flash file tab is activated. You may position the properties for the source of the .SWF file that is Adobe Flash Player compatible in the page heading, or use the default settings. Click Browse to select from a list of Shockwave Flash Objects (.SWF files that are Adobe Flash Player compatible) in your project directory. Tip: A preview of the Adobe Flash File animation appears in the Open dialog box, as shown in the following image. If you are having trouble viewing the .SWF file that is Adobe Flash Player compatible, ensure that Adobe Flash Player is installed. Click Open to close the Open dialog box. The selected Adobe Flash File (.SWF files that are Adobe Flash Player compatible) appears as the File source, as shown in the following image. Click URL as the source. Type the Adobe Flash File (.SWF files that are Adobe Flash Player compatible) location in the URL and click Open to verify the URL source in your web browser. 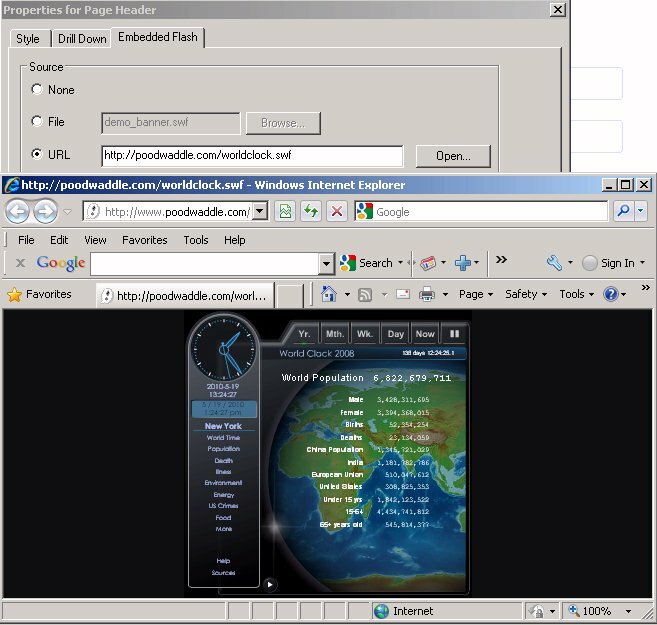 Note: The Open button is not activated until the location of a .SWF file that is Adobe Flash Player compatible is included in the URL source, as shown in the following example. Click Hold File as the source. Select an Adobe Flash File (.SWF files that are Adobe Flash Player compatible) temporary hold file from the drop-down list, as shown in the following image. Click Apply and OK to close the Properties for Page Header dialog box. The Adobe logo appears where the embedded Flash file source is positioned in the page heading. The PDF shows the Adobe Flash File in the output with its animation effects.